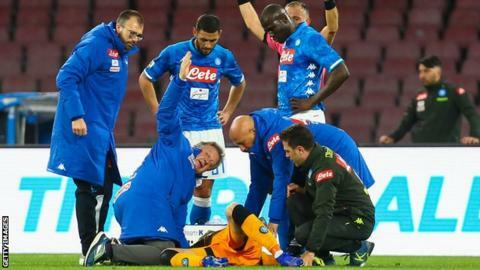 Arsenal goalkeeper David Ospina has been discharged from hospital after collapsing during Napoli's Serie A match against Udinese on Sunday. The Colombian, on a season-long loan at Napoli, sustained a blow to the head when he collided with Ignacio Pussetto early in the match. He fell to the ground shortly before the break after Udinese levelled at 2-2 having been 2-0 down. "David is much better," his wife Jesy Sterling said on Instagram. On Monday afternoon, Napoli confirmed the 30-year-old was set to rest and would not be joining up with Colombia during the international break. "David Ospina was discharged this afternoon from the Pineta Grande Clinic where he had been hospitalised last night for a series of investigations and specialist visits. All tests are negative," a statement from Napoli said.